Question please: The cups that are under the ring fingers of my right and left hands are "corked-over." Many other flutes I have seen in the store do not have cork over those keys and are open, especially the right hand ring finger cup. Please explain why mine has cork, why others do not and how mine differs. Could it be mine flute is tuned differently than other flutes? Underneathe those cork plugs are the standard "open holes". You have bought a flute that simply has $3 cork plugs inserted into the holes by the previous player. If you remove the pieces of cork (ask for help if you've never done this before) you will see the holes. If they don't push through (or if it's a Miyazawa, where you shouldn't push through or the bushing will fall out, which you don't want), you must lift them out. Get help taking them out. Consult a flute teacher or get help from a repair person. What was the purpose of corking them in the first place? If there's some benefit, I don't what to mess that up. When beginners start the flute, it is tricky for them to cover the open-holes with their finger pads. So we don't ask them to. As teachers, we give beginners advice to use a closed hole flute. After 3-5 years on a closed hole flute, some flutists eventually change to open-hole flutes. 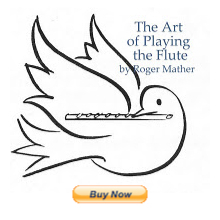 Because open-holes are popular, there are lots for sale; and you'll often find them with plugs left in the open holes so that the next person who tries that flute won't have to adjust immediately to the open-holes, but can try the flute as if it is a closed hole; thus giving them an immediate idea of how the flute plays, even if they've never played open-hole before. So the plugs are a way of changing back and forth between an open-hole and a closed hole without having to work out how you will change your hand position to close open holes; which takes several months. Plugs are also used with those who need extra help with only their ring fingers. A common way to play is with only the ring finger holes plugged with hole-plugs. I play with my holes plugged. I have no problem with plugged holes. Trevor Wye insists that the plugs flatten the pitch, but I have tested it and can correct the pitch with lip-angle, and am not worried. Do you find the type of metal the flute is made of makes a difference in sound quality or is that not a factor? Looking into the flutes in the store, most are yellowish (brass?) with silver plating on the outside and a few are silver inside and out. How do you tell what key a clarinet is? Should it be on the body somewhere? The cheaper the metal, the cheaper the flute and typically, the cheaper the workmanship (not as well made). The more expensive the metal, the more finely the flute is usually crafted. You can google instead of asking me directly, or you can use the search box on my site/blog to find previous articles on this. Try googling flute materials, gold, silver, plated. And I don't know the answer to clarinet questions; you'll have to google "how can I tell what key my clarinet is?" I did the googling on clarinets for you, because I wanted to prove how easy it was, but in fact it took me 30 minutes or more. The problem is that no one else is wording the clarinet question using that language exactly. Finger a C (sounds as a Bb on a Bb clarinet) and find a piano/keyboard (or electronic tuner, or tuning app on your phone). Determine if the C on the clarinet matches a B-flat on the piano. If your fingered C comes out as an A with the piano (or tuner, or tuning app on your phone) it is an A clarinet. If you're shopping online, ask for clarity, what key is this clarinet in? from the seller. If you're shopping in a pawn shop or junk store, remember that up to $300 worth of padding and repair might be needed to make the clarinet playable. I don't believe "my flute" needs pads but I'm sure if I took it to a musical instrument store and showed them they would tell me one way or another. Does it really cost $300 (or thereabouts) for new pads on flute or were you just talking about clarinets? The fourth comment above this one is the one where you say "clarinet". You must have miss-typed. Does that mean that I wasted all that googling time due to a typo? You asked "how do you tell what key a clarinet is in? Is it on the body somewhere?" Sounds like maybe you're thinking of becoming an instrument dealer or repair person? Takes five-eight years of training to repad a flute with guaranteed success. Yes, it costs at least $200-$300 in repair work to make an old, dried out, slightly bent flute or clarinet and make it playable again. A complete overhaul (every single pad replaced, and all mechanical problems fixed so the instrument is like "new") can be anywhere from $500 to $1500 U.S. depending on the expertise of the person repadding the instrument. Sure, you can get a cheap instrument, and do cheap repairs on it, but a person who plays the flute (or clarinet) for a living (teacher/performer/professional) would never play a cheapo flute or get cheapo repairs. So if you want to go the cheap route, don't ask a person who does this for a living, because they'll tell you that quality comes first. It's not about cheap, it's about a lifetime of discovery playing an instrument. Cheap causes that lifetime of possible pleasure to become less than a week of pleasure, followed by a month of frustration, followed by quitting. That's what happens when the instrument is not functioning well; the person gives up. Trust me. Now go find answers at the music store; you have to do more local research. I feel idiotic looking up clarinet things due to typos etc. P.S. All standard flutes are C-flutes. Try looking at pictures of the flute-family at Wikipedia and match up what you see with the flute in your hands. 99% of all flutes found in music stores are C-flutes. pps; you're not the first person to think that woodwind repair experts are "padding their wallets". I've even had a comment here that I keep telling people to go to flute teachers for lessons because I'm trying to pad MY wallet. hhahahahahhahaha. Ridiculous. Visit a real flute repair shop and watch the people at work; you'll soon know what dedication and expertise is. Not everyone in this world is after money; some of us are after QUALITY and EASE-OF-PLAY. Flute pads last 10 years if well cared for. They can be shimmed to close small leaks that appear every 6 months or so. If the flute's pads appear dirty, rough, abraded, then they might need to go to repair. If any note on the flute sounds fuzzy unless you press harder with a certain finger, then one pad is leaking, and you need to go to repair. If any octave of the flute is fuzzier (especially the low register) than the others, then you might have a pad leak too. Leaking pads, dried out pads, dirty pads, are all common on used instruments. Every used instrument needs to go to repair unless it has JUST been repaired. Expect to spend up to $250 a year on annual maintenance if you play the flute for 2 hrs. a day or more. After ten years, expect to pay for a complete re-pad. Most impoverished students (who have no money) need to ask their parents to help pay the annual repair bill. This is normal. That sounded like great advice. Thank you! I started out looking at Native American wood flutes .. five hole and the four hole drone which has dual wind pipes blown at the same time and one can play their own back up .. the originals were in ceramic and perhaps 6,000 years old from Central America .. some having 12 holes .. I'm thinking Nephilim with six fingers. No moving parts, no pads, no soft metal and oil. After reading you wonderful and truthful comments .. pads every ten years, shims and elfin magic once a week .. I think I'm back to the five hole wooden gig out on the ranch in Idaho. I know. We could always sing. Why use a flute at all? But on the other hand, no matter what the instrument, the resonances in the body and throat and head all have to open up and the air has to flow steadily and with feeling. So whether it is through the miracle of focus and poise or mechanical marvels that create instantaneous note changes (fingers on holes or key cups on chimneys) it's all the body making the song of life.